THE "PELOTE" (the name for the Ball), is made with a wound rubber center (like a golf ball construction) bound with cotton, plus two fine leather skins all sewn together. Each Pelote or ball is hand made and must form a perfect sphere on completion. The diameter is 65 mm and the total weight is from 115grms - 125grms and as hard as a stone, with measured speeds of 250 to 300 km /h when utilizing the Chistera, which makes this the fastest bat and ball sport in the world. The "Main Nue"(bare hand) is the ancestor of all the basque sports, the players use only the palms of their hands to hit the Pelote. The "Chistera" is the name used for the long curved basket (starting with a leather glove) which is made of different woods and reeds (hard & soft) for the games "Chistera" & "Cesta Punta". The Chistera can't be fabricated industrially, as tests were made with a plastic Chistera and it doesn't resist the temperature changes it has to go through during a game. It is a very long handcrafted process to make one of these and they are only made to order. The "Rebot" is the name used for the slightly shorter curved basket (starting with a leather glove) which is made of different woods and reeds (hard & soft) for the games "Rebot" & "Joko Garbi". The "Pala" is the name for a heavy wooden bat, which is used to play several different types of games, Pala, Pala Corta, Paleta, Paleta Gomme which are all different, according to the size of wooden bats (close to 1 kilo each). They are played with a pelote of 100grms. THE "FRONTON" is the name for a marked out court on the floor surfaces (some what like a Tennis court), which varies with the markings for the different types of game of Pelote Basque. Every self-respecting village in the Pays Basque and Southern Landes has its outdoor "Fronton" known as "Fronton Place Libre", which consist of a rectangular court marked with service and fault lines plus a large pink shaped wall at one end, marked with 2 vertical lines which define the playing area, the 2 sides and end are left open. The length of the Fronton Place Libre in each village defines what type of Pelote can be played on it, this seems to vary from 30m to 120m (the towns with 80m plus, generally have a wall at each end so that 2 games of Pala can be played at once or 1 game of Chistera). THE "JAÏ ALAÏ" is an in-door fronton covering a "cancha" (56 meters long) which is used exclusively to play Cesta Punta. The game utilizes three walls: the front (11.5m wide x 10.5m high), the back (10.5m wide x 9.0m high) and the left hand wall (marked at 10.5m high x length) which is divided in 14 "cuadros" (numbered from one - fourteen, 4.0m apart), on the right side of the court 3.5m over is a full height net to guard the stands and public galleries from this high speed game. Two teams of two play the game to 35 points. The service is made with a chistera from the number 11 cuadros (44 meters) and the ball (called a pelote) must bounce between the number 4 and the number 7 on the way back. If the pelote falls before the 4th cuadros (called "falta"), they loose the point and the other side commence to serve, and if it falls after the 7th cuadros (called "pasa") it is a half fault and they have a second chance at the service. 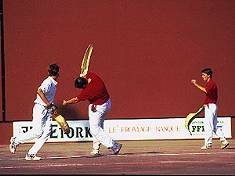 THE "FRONTON AVEC MUR A GAUCHE" (with left hand wall) is an in-door fronton covering a "cancha" (36 meters long) where Pala or Main Nue are played. The game utilizes three walls: the front (10.5m wide x 9.25m high), the back (9.5m wide x 8.0m high) and the left (marked at 9.25m high x length) which is divided in 10 "cuadros" (numbered from one - ten, 3.5m apart), on the right side of the court 2.5m over is a full height net to guard the public galleries from the players, (bats) and pelote. 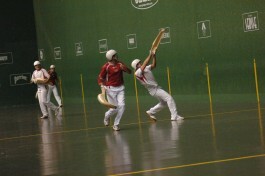 THE "TRINQUET" is an in-door fronton covering a "cancha" (28.5 meters long). The games utilize three walls: the front (9.30m wide x 8.50m high), the back (9.30m wide x 5.50m high) and the left (marked at 5.50m high x length) which is divided into 6 "cuadros" (numbered from one - six, 2.5m apart), starting 7.25m from the front wall, this court incorporates a right hand wall. The Trinquet has other added nightmares in the court area, an observation gallery (for lack of the real name) for the public or adjudicators to view, which has been constructed down the left hand wall and along the rear wall, 1.3m deep x 2.25m high with a sloped roof and netted windows. The gallery is included as part of the game, as the objective is to bounce the ball off several walls and the roof of the gallery to confuse the opponent as to where the ball might land. The right hand corner front wall is set at an angle of 45° x nearly ½ a meter wide, plus adjacent to this is a 60cm (2ft) square hole called a "Xilo", with angled edges and its center at 1.5m off the floor. If the player can hit the Xilo or the corner with the ball it can go anywhere, which creates a problem for their opponent.